Depending on the area where you are looking for a home you may find a home that has a septic system rather than a sewer line connection. Homes in some neighborhoods where the sewer lines have not been run instead have a septic tank which holds the waste water from the home. The holding tank has a number of different components but what it does is allow the waste from a home to decompose over time and work its way back into the ground in a harmless state. Some may say that a septic system is greener than a traditional sewer system since the homes waste goes into the immediate environment where it can be utilized immediately by the vegetation in your yard. With a sewer system the treatment of the waste happens at one central location which means many miles of piping to send the sewage to the right place. On the other hand improperly maintained septic systems can lead to backups and contaminated local land that can be costly to cleanup and damaging to the environment. Most home inspectors do not have the expertise to inspect septic systems. As a result depending on the age of the septic system and the condition of the land around the septic system it may be wise to have a separate inspection scheduled of the septic system. Septic systems that are not functioning properly can cause waste water to leak into the surround yard causing flooding issues as well as making the area not pleasant to be around due to bad odors. Poorly operating septic systems can also result in waste water backing up into the house causing further problems. Due to the expense associated with septic system repairs it is always advisable to have it inspected by a septic professional. Why Does A Home Have A Septic System Rather Than A Sewer Connection? Homebuyers may be wondering why a particular home may have a septic system rather than a sewer line connection. Often the reason for a home not having a sewer connection is simply the home is far from the sewer lines and no one has paid for the expense of running sewer to the home. Depending on when a home was built and where, even in areas where there are sewer lines to other homes certain homes may still have a local septic system rather than sewer connections. The costs to run sewer connections can be high and as a result many homeowners are unable to pay to run a sewer connection on their own. Local governments also may not be willing to pay for the expense of running local sewer lines to just a couple of homes that don’t have access due to limited funds. To run sewer lines require extensive planning and preparation in order to make sure the ground around where the sewer runs will be placed is accessible and the pipes integrity will not be damaged over time. Additionally the sewer lines must not interfere with other utility lines that have already been run to the home. As a result of the expense and complexity homes without sewer lines are usually left as is. Where new developments are being built with many homes going in, the city building and planning departments will usually require the builders/developers to install sewer connections as part of getting their developments approved. 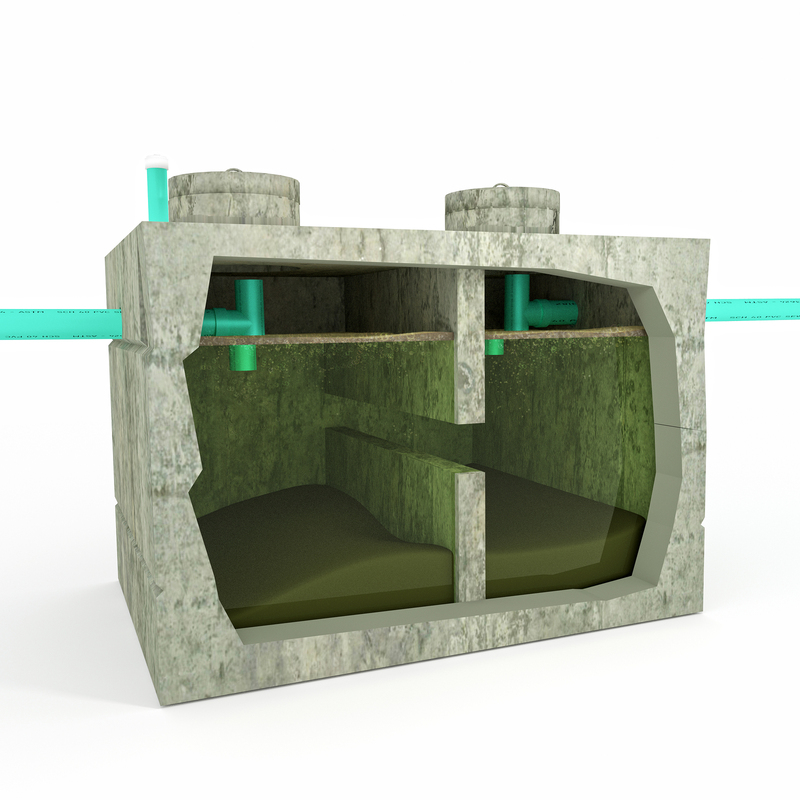 The waste water from a home’s bathrooms and kitchens are directed into a tank that is located underground on the property. Within the tank solids will fall and settle on the bottom due to gravity. Oil and anything else that floats will rise to the surface of the water within the tank. The middle layer consists mainly of water that also has bacteria that consume some of the waste material converting it into a byproduct that is less harmful outside of the septic tank. 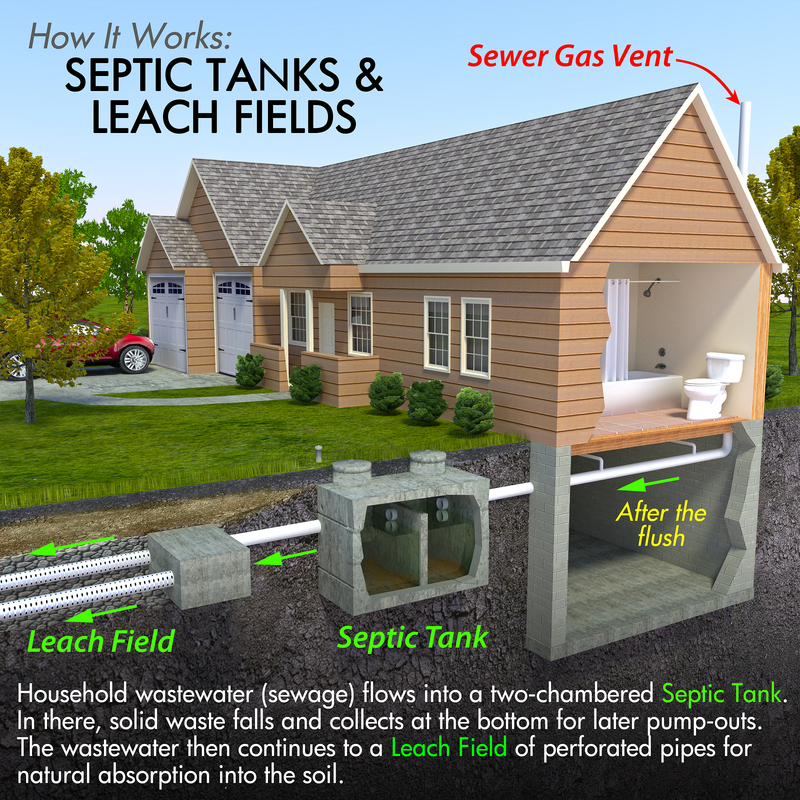 The septic tank drains to a drain or leach field where the water is slowly absorbed into the surrounding dirt. The bacteria in the tank that consume the waste in the water can be affected by what is poured down drains. Household cleaners (especially bleach), laundry detergent, dish wash detergent and more can have a negative impact on the bacteria colonies in the septic tank causing problems with the tank over time. Therefore it is recommended that natural cleaners and detergents or those labeled as safe for septic tanks be used within a home that has a septic system. Over time the sludge that builds up at the bottom of a septic tank may need to be removed in order to maintain optimal efficiency of the septic system. Excess amounts of sludge can reduce the septic systems ability to handle all the household drain water causing backed up plumbing or flooding in the areas where the tank is located. Many municipalities where septic systems are located will require regular inspections and maintenance for homeowners in order to ensure they are working properly and to prevent contamination of the local environment and waterways. Where some septic systems work only with gravity there are other systems that use pumps in order to move water from the main septic tank to the drain field. Usually the waste water that drains from the home to the septic tank is gravity driven and from there a pump can be used to move the wastewater. Electric pumping systems add a level of complexity to the septic system whereby continued monitoring of the septic pump is needed to ensure the tank does not overflow. A battery backup system and/or water level monitoring alarm may be installed for added protection of the septic system and the home. 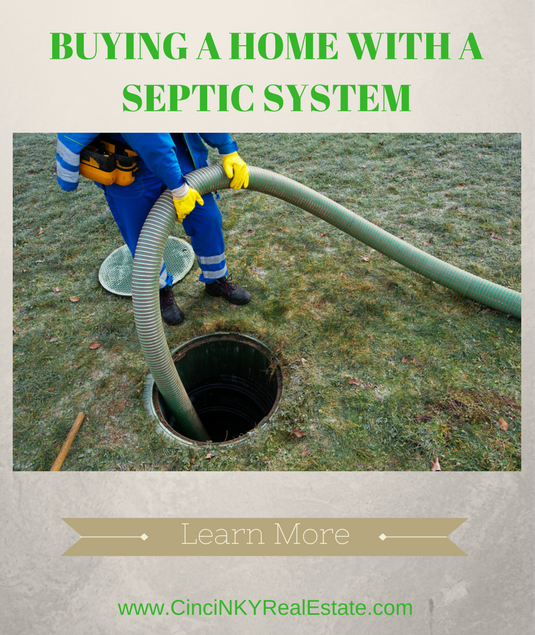 How Do I Maintain A Home With A Septic System? As noted above using cleaners that are approved for septic systems is better for the overall health of the septic system. Not putting oils down the drain and not using a food disposal system can also help prevent septic system backups or malfunctions. Septic systems should be pumped out on a 3-5 year time table depending on household use in order to make sure the layer of solids is not displacing too much water in the system. Homeowners can add bacteria supplements to the tank in order to ensure a healthy system which can be as simple as flushing a bacteria pack down the toilet based on the manufacturer directions. Anytime a septic system overflows or backups homeowners should make sure they try not to run water through the drains than absolutely necessary as the septic system can backflow into a home causing much greater damage. A professional septic system servicer should be contacted to evaluate and repair the septic system as soon as possible. Some municipalities will fine homeowners for improperly maintained septic systems that back up and cause flooding. Depending on the location of a home, homebuyers may be confronted with the option of buying a home with a septic system. Septic systems need regular monitoring in order to ensure everything is running smoothly. There may be options for homeowners to connect to the sewer line but the price for running such connections can high if the homeowner has to pay for it themselves. About the author: The above article “Buying A Home With A Septic System” was provided by Luxury Real Estate Specialist Paul Sian. Paul can be reached at paul@CinciNKYRealEstate.com or by phone at 513-560-8002. If you’re thinking of selling or buying your investment or commercial business property I would love to share my marketing knowledge and expertise to help you. Contact me today! Great Article! This is really true, Septic Tanks are really important especially in buying a house. Sometimes there are homes near to the sewer pipe so they have direct contact to it but when buying a house, it is a great factor if it has a septic tank. Some of it doesn't have it but there are septic tank installation services for it.